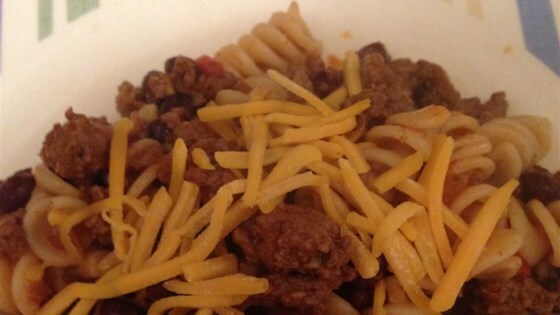 "This is a low fat and deliciously filling meal with lots of flavor . Serve with crusty bread and a tossed green salad." In a small bowl roll beef strips in the taco seasoning until coated. In a large skillet over medium heat, warm olive oil. Saute beef and garlic until beef is no longer pink; about 4 minutes. Remove with a slotted spoon and set aside. Mix together in skillet the cooked pasta, black beans, salsa and water; cook for 4 to 5 minutes. Combine with beef in a large bowl and serve sprinkled with cilantro. This was good, but a little spicy for my taste. Instead of just salsa I would use some stewed tomatoes next time. This was quick, easy, and tasty. The kids thought that it was too spicy, but I would make it again for my husband and me. We liked shredded cheddar cheese sprinkled on top, too. This was easy and delicious. I used the chipotle taco mix and topped with a cilantro lime pesto from Whole Foods. A very quick dish. I was in need of a fun new recipie one night so that I could cook for my boyfriend... This turned out wonderful!